NETWORK FINALS: 48 HOURS, 20/20 and the MAKING IT and DATELINE reruns lost 0.1 in final numbers. CABLE HIGHLIGHTS: A&E’s LIVE PD led Saturday cable, down 0.05 to 0.66, with the preceding clip show down 0.06 to 0.28. Adult Swim’s late-night line-up performed as follows: DRAGON BALL steady at 0.36, MY HERO ACADEMIA down 0.04 to 0.23/504K, FLCL down 0.05 to 0.16/376K, POP TEAM EPIC down 0.02 to 0.15, JOJO’S BIZARRE ADVENTURE down 0.03 to 0.14, HUNTER X HUNTER down 0.02 to 0.15/310K, BLACK CLOVER up 0.01 to 0.17/327K, NARUTO up 0.02 to 0.16/306K, SPACE DANDY down 0.01 to 0.13/248K, COWBOY BEBOP steady at 0.13/236K, and LUPIN THE 3RD down 0.01 to 0.12/226K. FX’s UFC PRELIMS was at 0.30. 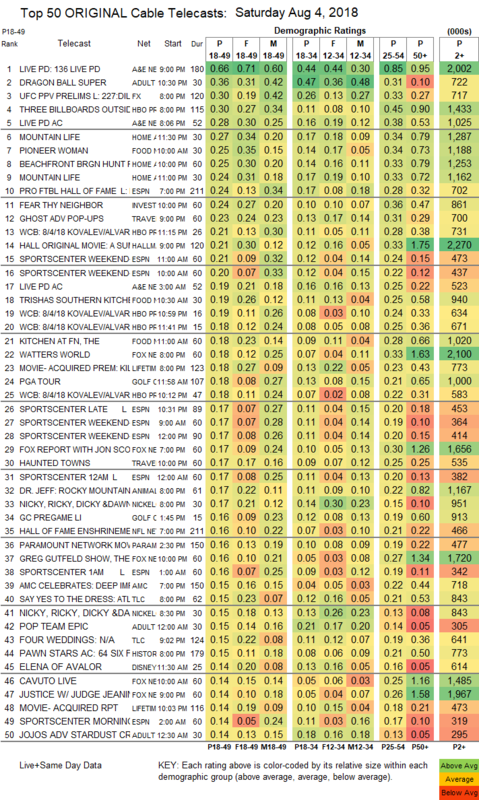 On HGTV, MOUNTAIN LIFE was at 0.27/0.24, compared to last week’s 0.21/0.19, and BEACHFRONT BARGAIN HUNT was at 0.25. On Food Network, PIONEER WOMAN gained 0.03 to 0.25, TRISHA’S SOUTHERN KITCHEN was down 0.02 to 0.19, and KITCHEN AT FN dropped 0.04 to 0.18. ESPN’s coverage of the PRO FOOTBALL HALL OF FAME induction ceremony was at 0.24. ID’s FEAR THY NEIGHBOR ticked up to 0.24. Travel Channel’s GHOST ADVENTURE POP-UPS slipped 0.02 to 0.23. Hallmark’s original movie A SUMMER TO REMEMBER was at 0.21. On TLC, SAY YES TO THE DRESS fell 0.04 to 0.15, and FOUR WEDDINGS ticked down to 0.15.